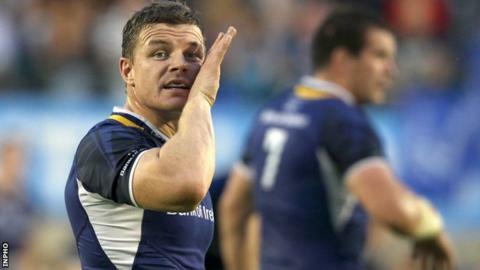 Jonathan Sexton's last-gasp drop goal helped Leinster edge out Benetton Treviso in Italy as Brian O'Driscoll returned to action with a try. Robert Barbieri's score helped the home side lead 8-0 before O'Driscoll ran in a 44th-minute try after his own break. Two Sexton penalties pushed Leinster's lead to 16-11 before Fabio Semenzato's 77th-minute try levelled the contest. Kris Burton's conversion appeared to have won the game but Sexton landed the decisive drop goal in injury-time. Treviso, two weeks after their opening win over champions the Ospreys, started brightly with Alberto di Bernardo kicking them into an early lead. Several of Leinster's big-name players were making their first starts of the campaign with Sexton, Eoin Reddan, Jamie Heaslip and Shane Jennings among those joining O'Driscoll in making their seasonal debuts. The home side then exploited the sin-binning of Leinster flanker Kevin McLaughlin as Barbieri powered over for a try after a quickly-taken penalty. Sexton cut into Treviso's lead with a penalty just before half-time but the home side led by five points at the interval. O'Driscoll ran from midfield to cross the line unopposed four minutes after the break with Sexton's conversion putting the visitors ahead. A further Sexton penalty increased Leinster's lead to five and while Burton replied in kind, a further three points from the Ireland fly-half restored the away team's five-point advantage with six minutes of normal time left. However, Treviso then looked to have snatched a dramatic win as replacement scrum-half Semenzato crossed the line with three minutes remaining with Burton knocking over the conversion to put the Italians two points up. But there was still time for Sexton to slot a winning drop goal for the relieved Heineken Cup champions. Benetton Treviso: Luke McLean; Edoardo Gori, Tommaso Benvenuti, Alberto Sgarbi, Ludovico Nitoglia; Alberto Di Bernardo, Tobias Botes; Alberto De Marchi, Leonardo Ghiraldini, Ignacio Fernandez-Rouyet; Francesco Minto, Corniel Van Zyl (capt); Simone Favaro, Alessandro Zanni, Robert Barbieri. Replacements: Fabio Semenzato for Nitoglia 69 mins, Kris Burton for Botes 54, Michele Rizzo for De Marchi 54, Franco Sbaraglini for Ghiraldini 60, Lorenzo Cittadini for Rouyet 54, Valerio Bernabo for van Zyl 24, Marco Filippucci for Barbieri 60. Leinster: Ian Madigan; Andrew Conway, Brian O'Driscoll, Fergus McFadden, Fionn Carr; Jonathan Sexton, Eoin Reddan; Heinke van der Merwe, Richardt Strauss, Mike Ross; Damian Browne, Devin Toner; Kevin McLaughlin, Shane Jennings, Jamie Heaslip. Replacements: Sean Cronin for Ross 63, Cian Healy for van der Merwe 60, Jamie Hagan for Strauss 63, Leo Cullen for Browne 63, John Cooney for Reddan 66, Isa Nacewa for Madigan 49.